The best season for hunting is autumn. At this time of year, the boar often leaves the forest to the fields to feed on crops, so you can easily set up an ambush in this place. Early autumn is ideal for sighting shots, because at this time the boar enters the fields for eating immediately after sunset, but in late autumn it will come out much later (the street will be quite dark). It is not recommended to hunt in late autumn because the boars often fight for territory at this time, therefore they are especially aggressive. In winter, you have to independently track down the animal in the forest. However, there is a small trick: you can feed the boar in advance to lure him out of the forest. Top dressing is recommended to do near small reservoirs – so it is more difficult for an animal to hunt you down (for hunting near a feeding place you can make a tower for shooting). In winter, boars often sleep on warm anthills, so you can find them there. But in spring and early summer it is quite difficult to hunt – the boar will spend most of the time in the forest, and the pre-feeding scenario may not work, because during these periods the wild boar has enough natural forest food. Wild boar is a large massive animal, the average weight of which is 200-300 kg. Boars and sows live in a wooded area, feed on various fruits, roots, acorns and small animals. They can eat potatoes and grain crops (as well as domestic pigs), therefore they often rob agricultural land. Males lead a solitary life, and sows gather in small herds, which include young and young boars. During the day, animals usually sleep in their pits, and in the evening they go out in search of food. Before the main hunt, the terrain should be studied to determine where the boars sleep and eat. During the inspection of the territory, pay attention to the trees – if the bark is peeled high, it means that a large tall boar lives here. It is best to shoot from cover to protect yourself in case of an unsuccessful attack (the best option for cover is a low platform). On the hunt you can not go straight along the animal path, because the animal can smell your smell. If a boar finds you, it can hide or run away, however, most of the boars, sensing the hunter, immediately rush to the attack (the probability of an attack increases noticeably if you stumble upon a sow with cubs). Both smooth-bore and rifled weapons are suitable for hunting – a large caliber should be used (at least 7.62 × 51), because the boar is a strong and tenacious animal, small bullets may not cause serious harm to it. When shooting, try to get into the heart, head or lungs. However, be careful, because even with a damaged heart the animal can be a danger to the hunter for quite a long time. If you hit the animal and it fell, you need to make a control shot to the head in the brain area, since the wounded boar can rise from the ground and attack the hunter. If you hit a vital organ with a shot (for example, a heart) and the animal ran away, then it is recommended to let it go, and it is better to go in search of a boar in 10-12 hours (during this time the boar will weaken or die extremely). One day before the hunt it is forbidden to drink alcohol or smoke. You can not use cologne or repellents against mosquitoes, because strong odors will give you away. Clothing for hunting must be ventilated in advance to get rid of extraneous odors, and it is best to wear a special hunting suit. To lure you can use special decoys that mimic the sounds of other animals. You can lure a boar with the sounds of small animals that he feeds on (hares, roes), as well as the squeal of other boars. Hunting with decoys should be carried out in calm weather, so that your sounds can be heard. If you went hunting and blew the wind, then while baiting with the help of a bait you need to take into account the direction of the wind – if it blows your sounds aside, then the boar simply will not hear you. It is necessary to remember that it is necessary to make sounds from a distance so that the animal does not see the hunter – if it hears the sound of a large animal, but does not see it, it can become furious and lash out. Brass decoys. They are whistles that can imitate animal sounds. 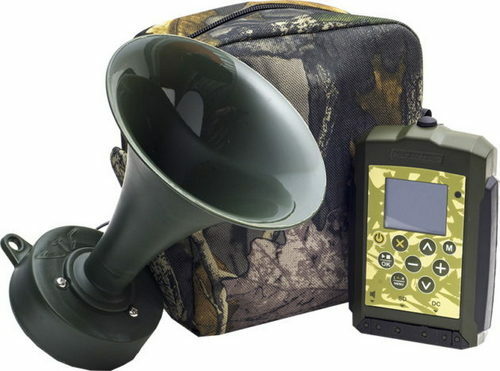 Before hunting, it is recommended to practice with the whistle at home to learn how to make both loud and quiet sounds. The use of wind decoys is not regulated by law, so any hunter can use them. Electronic decoy. Such devices are small electronic devices on which the sounds of certain animals are recorded. The main advantage of an electronic device is that in most cases it is possible to record own sounds on it, which significantly expands the functionality of the device. You can make a boar bait with your own hands – just transfer to your phone the sounds that may be of interest to the animal (below we have placed a few such sounds). 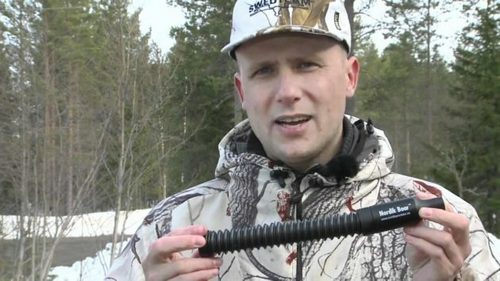 Unfortunately, in Russia the law in most cases prohibits the use of electronic devices, so hunters use them at their own peril and risk. If you are going to go hunting for the first time, it is recommended to listen to the sounds that make wild boars in different situations in their natural habitat. Please note that they can be used as an electronic decoy, because boars attract the attention of the sounds that other boars make. However, remember that each sound attracts attention in different ways, which must be considered when hunting.